We will custom design and manufacture an automatic coiling machine and pipe coiler that are able to winding the pipe&hose which covers the strapping requirement. 1. Ease operation and maintenance with HMI and PLC. 2. Coiling size easy changing. 5. 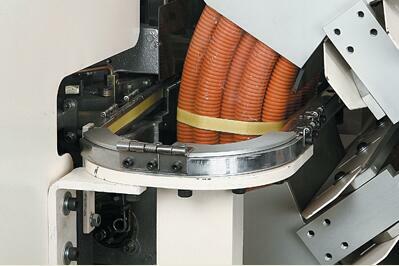 Automatic strapping the coiling and out feeding. We providing solution for the wide range of pipe size by coiling machines for your production, we also providing solution fully automatic machines for coiling and strapping too. The automatic tube coiling& strapping machinery all conform to CE guidelines and have been designed using the latest technology and design criteria for industrial use. The FHOPEPACK provides packaging solutions for the tube industry. Our commitment to the industry has resulted in the development of innovative, cost efficient products that address problems like loose, irregular packaging. Our sales, equipment service, customer service and engineering departments can help you design the optimum protective packaging system for your application. 1) Function: It is winding equipment for calculating the tube length, cutting the tube, coiling the tube in coil, fixing the tube coil, strapping the coil moving the tube coil automatically. The figure can be set in the PLC control program.